Large Berry Bowl and saucer set. Wheel-thrown using white stoneware and fired to Cone 6. With hand drawn Flower border using mishima and black underglaze decoration. 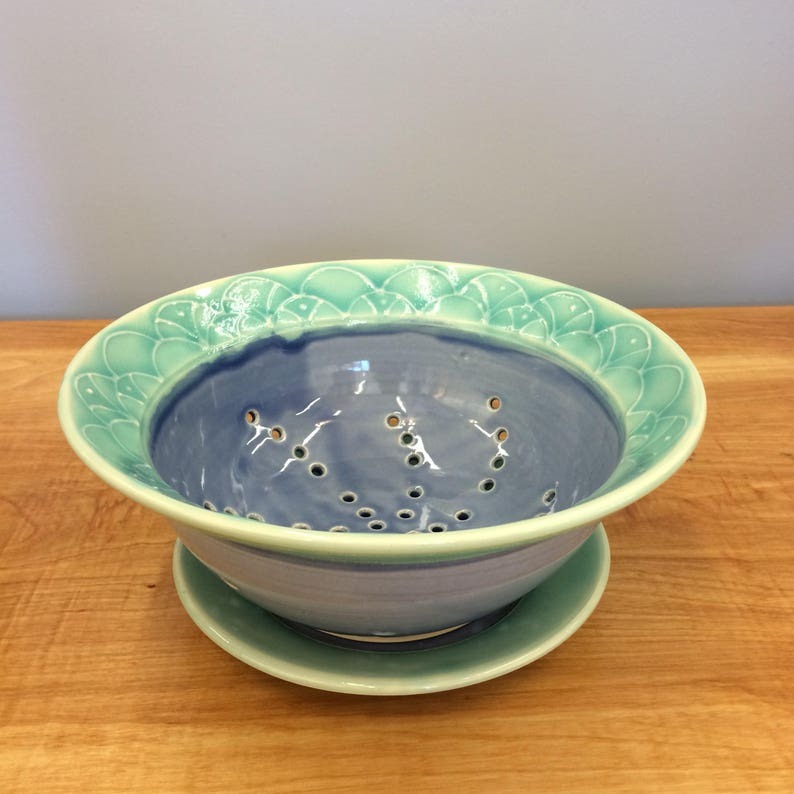 Glazed in Aqua (body of the bowl) and Blue (dot details). Awesome work on the mug! Beautifully crafted! Incredibly well packaged! Can not wait to gift this to my sister-in-law who is a consummate possum fan. Thank you MariaAndradePottery! A perfect, wonderfully crafted piece of functional ceramic art. I currently use Direct Checkout through Etsy. If you would like to arrange a different form of payment, please contact me. Residents of North Carolina will be charged sales tax. If you receive a damage piece, please notify me ASAP. Keep all packing materials and email me pictures of the damaged box and/or pieces. If you do not like the piece you bought, I am happy to exchange or refund it with 7 days of receipt. Just let me know. The buyer will be responsible for return shipping charges. Please keep all packing materials to ship work safely back to me. As soon as I receive the piece(s), I will issue you a refund. I will ship your items within 3-5 business days. Your pottery will arrive packed in a box with peanuts, bubble wrap. I double box certain items depending on size. Whenever possible, I recycle packing materials. I use USPS, and your box(es) will be insured. I will also email you the tracking number for your order. Please make we are shipping your order to a secure location. Maria Andrade Troya Pottery is not resposible for stolen packages. Currently, I only ship in the United States. If you would like a custom made piece, please do not hesitate to contact me. It can take 1-3 months depending on where I am on my process. I can also work from photographs, if you would like to have a custom pet portrait piece. All handmade pottery needs a little extra love. Although everything I make is microwave and dishwasher safe, you will extend the life of your pottery by hand washing. I do not recommend heating liquids in the microwave to boiling point in your handmade pots! Pre-warm cups and teapots before you pour boiling water from a kettle. When you purchase anything from Maria Andrade Pottery, you agree to hold Maria Andrade Troya harmless from any loss, damage or injury due to any products purchased from us. Our maximum liability to you is the amount you paid for the item(s) purchased.